It is indeed an inhumane act of the United States by dropping a bomb weighing nearly 10,000kg by 9m long to destroy ISIS troops hiding in a cave cave, criticized former Afghan President Hamid Karzai.Former President Karzai is disappointed at the actions of the United States, he considers bomb attacks to obliterate the ISIS troop who hid in the cave cave as a test event. Indeed, the criticism of the former president is true, because according to the BBC's first new report in war history, the US military says it has dropped the largest non-nuclear bomb ever held. 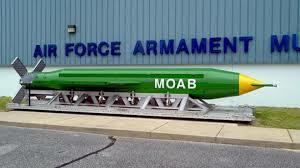 The GBU-43 / B Bomb Massive Ordnance Air Blast Bomb (MOAB), known as the "mother of bombs" was used to attack a group hideout calling itself the Islamic State or ISIS in Afghanistan, in Nangarhar Province. The 9.800kg bomb and nine meters long was dropped in Achin district on Thursday night (13/4/2017), according to information from the US Department of Defense or Pentagon obtained by the BBC. The attack aims to destroy ISIS caves, while at the same time minimizing its impact on Afghan and US forces carrying out security operations in the region. The White House also confirmed the use of America's largest non-nuclear bomb. "We attacked the tunnel and cave system used freely by ISIS fighters to easily attack US military advisers and Afghan forces in the area," White House spokesman Sean Spicer said. Local sources said the explosion was so powerful that its voice was heard in two districts adjacent to Achin district.The United States has not provided details of the impact of the attacks, but a local official told the BBC that many ISIS militants were killed. 0 Response to "Demonstrating Force in North Korea the United States Dropped His Mother's Bomb in Afghanistan"